Do you think it is illegal to eat dog meat in the UK? Well, what do you think? What are your reasons for that answer? Show your workings! Do you think its legal for me, to kill my dog and then eat her? So long as it was “humane”? Well actually, after speaking with the RSPCA, they have confirmed that there is no law to prevent me killing my dog, whether she is ill or not, and then eating her corpse. I can chop her up, season her and cook her on the BBQ. I could serve her to friends and family, in fact you could bring your dogs over and we could kill them all and cook them together! I mean, protein is protein and Dog meat contains 19g per 100g. That’s not bad! They are made of meat so we must be meant to eat them, right? We have teeth named after them to eat them! Its meant to be! If you don’t eat one, I’ll eat two! The reason for this post and the reason I asked the question of the RSPCA is to try and point out something. Hopefully, the non-vegans reading this would’ve felt something not right about picturing me killing a healthy dog and eating “it”. Or a group of us killing healthy dogs and enjoying the meat on a BBQ. That feeling, the uneasiness and hopefully sickening feeling and the thoughts aimed at me for talking about butchering innocent dogs, is the same feeling that vegans feel when we think about cows, sheep, pigs, fish, chicken….etc. etc. being killed for nothing other than taste (which can either be replicated or carnists cover with veggies and herbs anyway). It is only because you have been distanced from animals used for food that you don’t have that connection with them. When you realise that there isn’t anything different between a pig or a dog or a cow or a lamb etc. You will understand why people are vegan. Being vegan is easy when you put the victim first. It isn’t about what food or products you miss out on, it’s about doing what is right for others. Below is their response in full. I have contacted DEFRA as they have suggested, but as of yet have heard nothing. I will try again and send them a link to the post so they can see the context and not just think I am looking to get in the Dog meat trade. 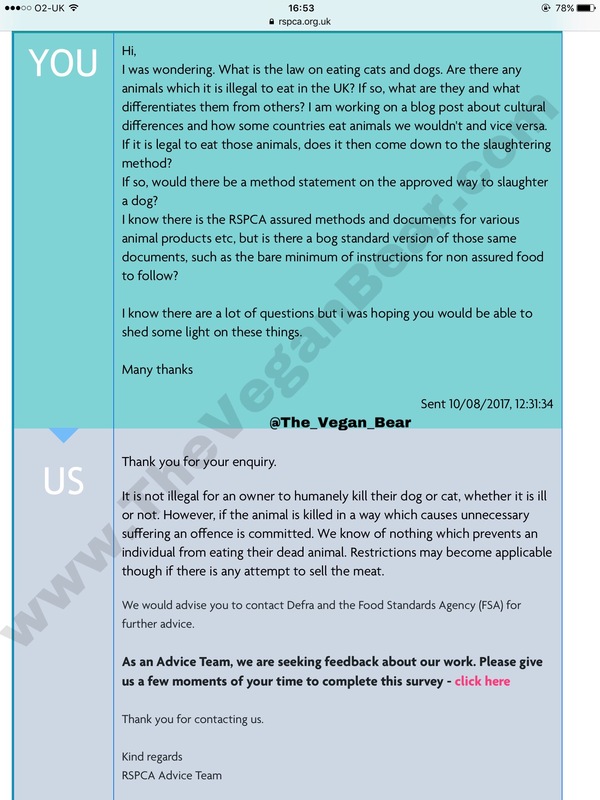 I also replied to the RSPCA asking what methods they would class as “humane” for killing my dog ready to eat. I will update if/when I get an answer. I have still not received any response from both the Food Standards Agency nor DEFRA. The RSPCA will not confirm what a humane method of killing a dog is, as can be seen by their response below. In fact, they seemed quite annoyed (we’ve all used the “as per previous email”, “as stated in last message” etc before, when we are pissed). Also, what may seem troubling to some, they haven’t passed comment on the moral aspects relating to killing my dog. My original question did mention cultural differences when it comes to which animals we eat so there was opportunity to mention something. I have replied again asking some more questions, mainly if an individual was reported for using methods from the RSPCA Assured slaughter standards on their dog at home, would the RSPCA prosecute the individual? 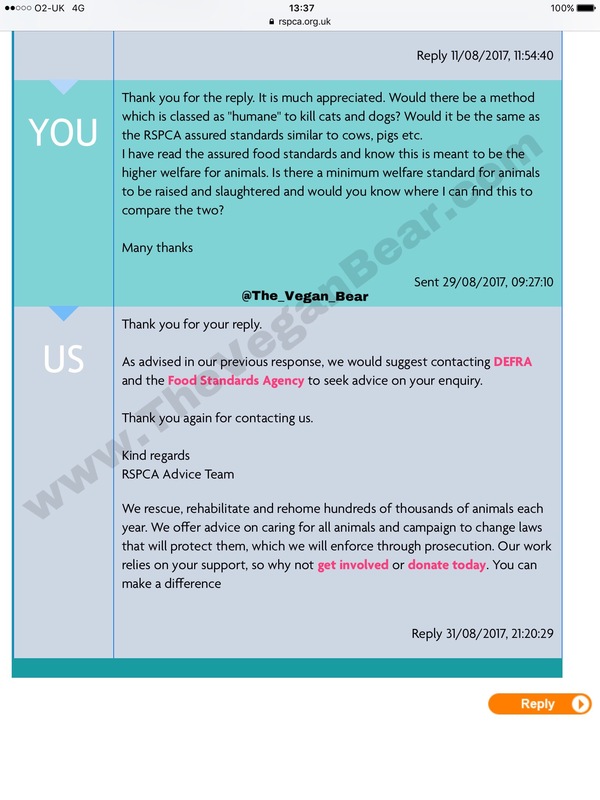 Or would they not have an issue as it’s supposedly the more humane method they proudly put their name to for so many other animals. If I get a response I will update again. As I will if DEFRA and the FSA reply. 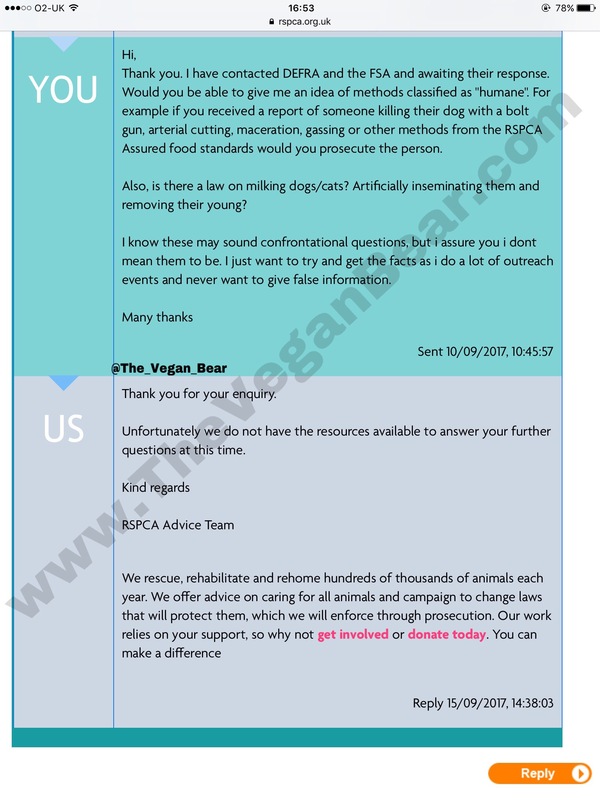 I have received another reply from the RSPCA which is very disappointing. One would think they don’t want to answer the question. It seems a simple one to answer. Well, two. If a dog was killed in the “humane” way they detail for sheep, cows, chicks, pigs etc would they prosecute the owner if it was reported. The second question was asking if I could milk my dog after forcibly impregnating her and taking her young. The fact they didn’t answer doesn’t surprise me although it does disappoint me. I’ll let you decide why you feel they didn’t answer. Feel free to message them for answers, they may be more inclined to answer these questions from others. 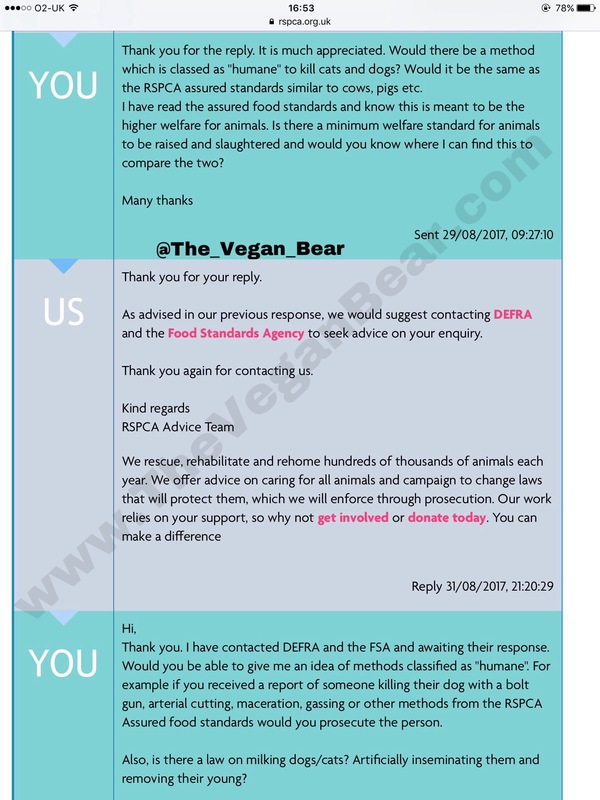 The questions I asked of the FSA and DEFRA (both on the same email so they knew I was messaging both of them) are below. I was wondering if you could help with an enquiry I have for an article I am writing. The RSPCA have pointed me into both of your directions. My initial question to the RSPCA was if there were any laws against killing your dog/cat and then eating it. I know that sounds like a crazy thing to ask, but I run an Animal Rights group and a vegan website; so it is for an article to discuss the difference between traditional animals raised for meat versus ones we don’t deem as acceptable to be eaten. What is the law regarding selling dog/cat meat? Either privately and/or from supermarkets? Can dog/cat meat be served at a local event if it is not sold, but given free from a stand such as a BBQ at a fete? Also, is there a difference legally/labelling wise with selling rabbit meat from wild/farmed rabbits and domestic rabbits? Any assistance in answering the above questions would be genuinely appreciated. We shall see if they respond at all. I’ve been protein deficient (vegan) for just over a year. I need a good source of protein and my dog is starting to look very tasty indeed in light of your letter. He’s basically just a hairier pig, right? Thanks for checking with the RSPCA and getting the low down for me. Thank you so much for that quote. It’s so true, they clearly have double standards. The fact they put their name to meat and other products shows that.